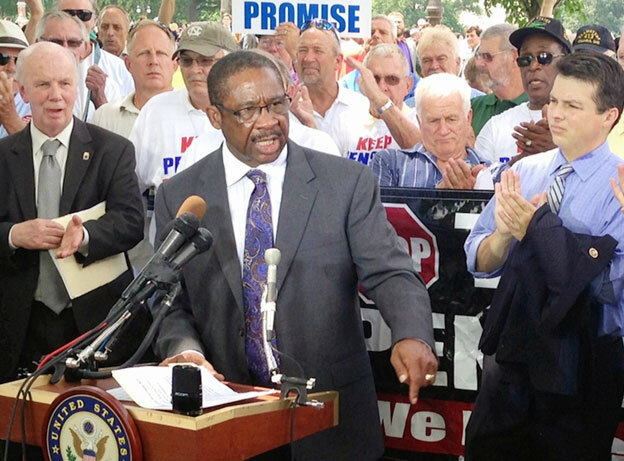 IAM General Secretary-Treasurer Robert Roach, Jr., speaks in support of the “Keeping Our Pension Promises Act” at a press conference in Washington, DC. IAM General Secretary-Treasurer Robert Roach, Jr., who is retiring July 31, 2015, will continue the fight to protect pensions for American workers as the newest member on the Board of Directors at the Pension Rights Center (PRC) in Washington, DC. The PRC promotes retirement security for American workers, retirees and their families through advocacy, public awareness, legal training and advice. Roach recently worked closely with the PRC to secure the introduction of the Keep Our Pension Promises Act, which would prevent cuts to pensions of current retirees. Current members of the Board include some of the country’s foremost experts in retirement income security. Roach has years of experience dealing with employer pension plans for the IAM and has prior service as a co-chair and trustee for the IAM National Pension Fund. Before becoming the IAM’s chief financial officer, Roach regularly testified before Congress on issues surrounding employee pensions as the IAM’s Transportation General Vice President. Roach has served as a member of the International Transport Workers’ Federation Executive Board and Management Committees for over 12 years and held executive positions on the AFL-CIO’s Transportation and Maritime trades departments. He holds a B.S. in Labor and Management Relations from SUNY Empire State College’s Harry Van Arsdale Jr. Center for Labor Studies and is a graduate of the Labor Liberal Arts Program at Cornell University.